The ultimate guide to Les Houches ski holidays. 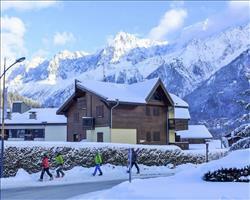 Sometimes grouped with the Chamonix ski area, sometimes seen as a resort of its own standing… Either way, the views of the Mont Blanc massif up top are gobsmacking, the tree-lined runs are a treat to ski and the cosy hamlets make a wonderfully homely base for the week. 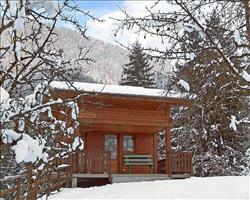 Les Houches is a cluster of hamlets spread across eight kilometres of the Chamonix valley. In the centre, farmhouses and chapels (like the baroque Eglise Saint-Jean-Baptiste) give the place a traditional feel, while modern builds on the hillsides (still in traditional chalet style) have the convenience of doorstep skiing. A ten minute or so walk apart, the Prarion gondola and Bellevue cableway provide access to the ski area. It earned its place in the history books after hosting the first winter Olympics in 1924, and comes back into the spotlight every year, when the Kandahar Alpine Ski World Cup race takes place on La Verte – continuing the legacy Sir Arnold Lunn began in 1948. When it comes to location and access, this place is amazing. The legendary mountain town of Chamonix is a ten-minute drive away, and the SNCF train line goes between Servoz and Vallorcine, stopping at Les Houches, Chamonix and Argentière. The Chamonix Bus runs between a number of the resort bases, while the historic Le Tramway du Mont-Blanc takes travellers between Les Houches and St Gervais via an old school rack and pinion train. If that’s not enough, you also have one of the shortest airport transfer times in the alps, with Geneva being just over an hour’s drive away. Les Houches has its own ski area, but is connected to others in the valley by the Mont Blanc Unlimited Pass which covers Brevent-Flégère, Grands Montets, Vallorcine, Aiguille du Midi, St Gervais, Megeve and even Italy’s Courmayeur and Switzerland’s Verbier. View our detailed Les Houches snow forecast or snow report and see all live webcams, piste maps, road and travel maps and lift pass prices. For a picture of historic snow conditions see the snow depths month by month with our Les Houches snow history. The local slopes are mainly suited to beginner and intermediate skiers. Boarders might be put off by the number of drag lifts and flat sections, but for some the easy-to-reach off piste and snow park make up for it. There are a couple of learner slopes up at the Prarion and Bellevue top stations (we prefer Bellevue’s which is longer and smoother). The Melezes chair serves a number of cruisey blues and the snowpark, which has lines for newbies and experts. For intermediates, Plan du Cret and Plancerts (towards St Gervais) are often fairly empty, leaving you free to ski at your own pace. On the other side, Table d’Orientation and Rouge Maison Neuve dip in and out of the long blue Aillouds run, which takes you back to Prarion, or links up to Joriand for a route into Bellevue. The other way back to base is the legendary black Kandahar piste (also known as La Verte), which holds the men’s downhill world cup race every year. Experts can tackle the full 3.34km descent, which world champions polish off in 2 minutes… Otherwise, you can ski the second half of the slope from red graded Mur des Epines, easing off onto the Aillouds to finish or continuing the challenge all the way to the bottom. Because the area’s known for its beginner and intermediate terrain, the powder between the trees often stays untouched – a real treat on good snow days. 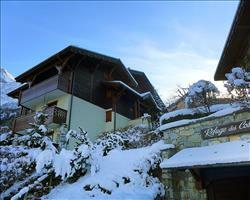 For a change of scenery, there are a number of other ski resorts within easy reach. You can get to the centre of Chamonix by car in just over 10 minutes for the Brevent and Flegre areas, while both Saint Gervais and Argentiniere are about a 20-minute drive away. Apres isn’t as lively here as it is over in Chamonix, but you’ll still find some good bars to relax in. The Kitsch Inn by the base of the Bellevue lift ticks a lot of boxes for its handy location, live music and drinks and snacks menu. Harry’s Bar (part of Hôtel du Bois) has squishy armchairs and big screens, while the Slalom Bar (in Hotel Slalom) is a chic drinking spot for good wine and cocktails. For foodies, La Delice on Rue d’Eglise has a brilliant menu with inspiration from all over Europe. Le Basilic serves everything from seafood and risotto to good old fashioned tartiflette. We like La Ferme des Agapes for raclette and Le Saint Antoine for pizza. If you’re celebrating a special occasion or just fancy pushing the boat out, book a table at Albert 1er in Chamonix or Megeve’s 1920 which both have two Michelin stars, or Le Sérac in St Gervais which has one star. Activity-wise, there’s indoor climbing at Mont Blanc Escalade, ice skating in the village and wellness facilities at Spa des Granges d'en Haut. When is the best time to ski Les Houches? The area is known for its treelined pistes, making this a good option when there’s low visibility. While the trees keep the slopes shaded when the weather warms, the lower area sometimes struggles on sunny spring days. However with Chamonix’s other ski areas within easy reach, you can still find good snow further afield if the area is struggling at the beginning or end of the season. 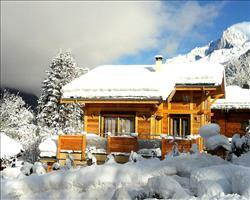 Pistes through woodland and a pretty village base make Christmas in Les Houches a charmer. Look out for torchlit descents on the Tourchet piste over New Year in Les Houches. 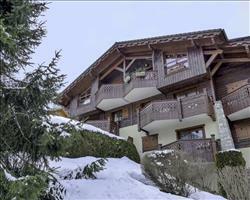 Half Term in Les Houches is often a quieter, cheaper option than skiing in neighbour Chamonix. The short transfer from Geneva is always a huge hit with families, who can roam the tree-lined runs here until the cows come home. Less experienced members of the brood can stick to the nursery slopes and greens, while those with more seasons under their belts take to the World Cup piste and powder between the pistes. There’s always the option for a family day trip to Chamonix and St Gervais to explore the pistes of a neighbouring ski area. Groups can stick to the local slopes, or head off to explore a different area each day – including the ski areas around Chamonix and St Gervais and Megeve. While the après ski and nightlife scene isn’t huge, there are some good pubs to serve as your local for the week. Excellent transport connections means everyone can travel in a way that suits them, whether it’s flying into Geneva, taking the ski train or driving from home.